Prominent & Leading Manufacturer from New Delhi, we offer 3d uv curing machine. Our entity is occupied in presenting a wide series of 3D UV Curing Unit. This product is extremely praised in the market due to their sturdy nature. Our provided product is developed under the leadership of skilled professionals who utilize the superior technology and reliable material. In addition, we provide this product at low prices. 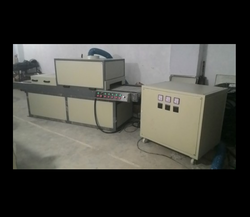 This machine is used in curing of 3D object Like Home theater front panel, TV Cabinet, helmet, helmet visor, Door, Door handle, Crawckery Items, Cosmetic items etc. For your Special requirement of any surface of the product curing please contact us.